The once pristine white columns that adorn the main courtyard at Henley Business School Africa have been painted over. If you look closely, the names of the people who did the work have been placed at the foot of each of the 24 columns. Not one art piece is the same. Henley should not be a place where you get an MBA or any other business qualification in order to join an elite club of conformist business leaders, he says. On the contrary, it should turn you into a business disruptor. “There’s a direct correlation between economic growth and the growth of creative industries, especially in emerging economies. If you build creatives you build economies, it’s that simple. If you bring creativity to business acumen it’s not just about feeling good but providing a deeper provocation into the current economic hegemony. Already recognised for its family-friendly programme and pro-poor, community-intensive corporate social responsibility initiative MBAid, Henley’s art project titled Resurgence is as much about decolonising education as it is about creating an environment where students are not just welcome to question, they are actively encouraged to challenge. “The big difference between pedagogy, the teaching of children, and andragogy, the education of adults, is this concept of the learners being supplicant sitting at desks waiting to receive the wisdom of the greats with their hands outstretched versus the participant who comes here with their own lived experiences and knowledges wanting to add, to learn but to teach us too in the process. It’s learning between equals.” says Foster-Pedley. “The art is not collectors’ work, it’s not dead people’s art, but the work of people whom we should be connecting with, whom we are trying to give voice too. In a sense, if you like, we’re de-colonising education by de-columnising it. When you come here, you should see that world coming straight at you. The art project was partly inspired by an outdoor art project that has been held at Henley Business School at the University of Reading, UK. Danish artist Erik Peitersen has been retained to return every year and paint a massive outdoor mural of how he perceives the business school. The work is then allowed to weather over the year, until he comes back the following year to paint over it. 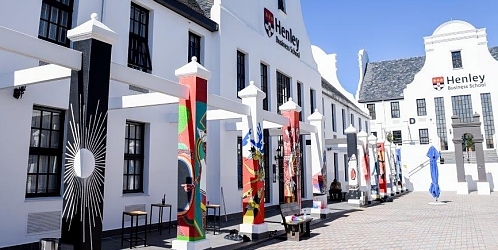 The response at Henley Business School Africa, says Foster-Pedley, has been overwhelming positive from students and faculty alike. “People say it brings a vibrancy to campus, making it feel like Cape Town – even if it is in the north of Johannesburg. Henley Business School Africa partnered with The Coloured Cube to give 12 up-and-coming artists - shortlisted from more than 80 applicants - two columns each to decorate as they see fit. Titled Resurgence, the project is about rebirth and revival says Coloured Cube founder and owner Mariapaola McGurk. “It’s about acknowledging past, culture and identity and exploring how these can transform as we look to the future,” she says. “Through our hosting of exploratory workshops, the artists came up with their own creative ideas, based on their own life experiences and culture. Henley, which is all about creativity, innovation and entrepreneurship, has embraced this forward-thinking approach,” she says. The artists: Erick Manganya, Keneilwe Mokoena, Vivien Kohler, Hans Foster, Leonard Baloyi, Celeste Theron, Nico Phooko, Nkosikhona Ngcobo, Pule Magopa, Zizicelo Sifumba, Tolo LikaKheswa and Tony Luza come from Gauteng, the Free State, Eastern Cape and Mpumalanga. For McGurk, the fact that the artists were not just getting the opportunity but also getting paid for their work was vitally important. Thanks to Business and Arts South Africa, she has also secured a supporting grant funded by the Department of Arts and Culture to take the 12 artists to Jeppestown, a very deprived area just east of the Joburg CBD to conduct workshops with primary and high school children. “The idea is that education must not be owned, but rather shared. This project achieved both the sharing of knowledge and the creativity,” she says. “The French believe in art as a provocation,” says Foster-Pedley, “a positive, uncomfortable stimulus to fresh thinking and new structures. We need that on all South African campuses, not just our own. #FeesMustFall grew straight out of #RhodesMustFall, finally mainstreaming a debate that had smouldered for decades. I want this project to break down walls.